Leyte and Samar Island may have been known as two of the provinces that were severely damaged by the Super Typhoon Yolanda (Haiyan) when it struck the Philippines in 2013. Despite that, however, the white sand beaches are still beautiful and the diving spots still delight the tourists. In addition, several beach resorts have bounced back gracefully and now offer some of the best accommodations and services! 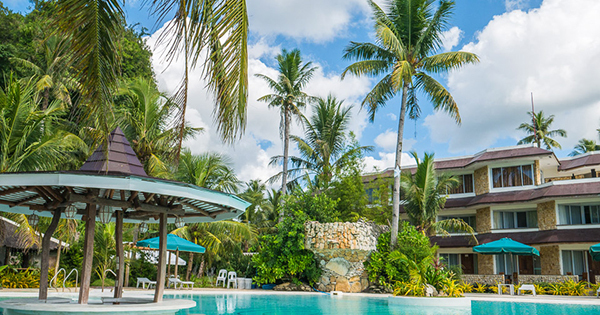 #1 - Padre Burgos Castle Resort: Nestled on a cliff overlooking a section of private beach along Sogod Bay in Southern Leyte, this boutique hotel and dive resort assure guests with superior relaxation and comfort. They offer luxurious accommodation, superb food whether inside the restaurant or outside by the pool, island tours, outstanding scuba diving and snorkeling, and even dolphin and whale shark watching! #2 - Peter's Dive Resort: Since 2000, this resort has been facilitating many divers from around the world wanting to explore the underwater paradise of Sogod Bay in Southern Leyte. They have various choices of accommodation, from private houses and cottages to affordable dormitory rooms, and they have special discount offers for group divers, too! Their amenities include a mini gym, swimming pool, air-conditioned restaurant, and a cocktail bar. #3 - Sogod Bay Scuba Resort: Explore over 25 unspoiled dive sites in this beach resort in Southern Leyte that is perfect for travelers who love scuba diving. Discover the pristine waters, exceptional reefs, and aquatic life that Sogod Bay is boasting about! Feel at home and stay at one of their twelve air-conditioned bedrooms and enjoy the view while dining at their al fresco dining terrace and bar that serves delicious food and beverages. #4 - Caluwayan Palm Island Resort: an ideal eco-tourism oriented resort designed to fit as a perfect alternative place of relaxation in Marabut, Western Samar, being surrounded by a breathtaking view of towering rock islands and islets with secluded coves and coral gardens, truly a paradise for scuba diving, snorkeling, sea kayaking, sailing, swimming, sun-bathing or simply lazing on the beach enjoying the view of the beautiful seascape of the bay. #5 - Seashore Spring Beach Resort: Experience the warmth and hospitality of the people of Northern Samar in this beach resort that offers simple and affordable yet comfortable dormitored houses or cottages. They also serve healthy and tasty oriental food. #6 - La Luna Beach Resort: Located in Calicoan Island in Guiuan, Eastern Samar, this beach resort is best known for owner Giampo's home-cooked three-course meal that is a fusion of Italian and Filipino dishes. Relax in one of the limited rooms and be captivated by the view of the sun setting by the ocean.